Is this Samsung with Snapdragon 808 the Galaxy S6 mini? Today the GFX Benchmark database turned out quite generous on spilling the beans on upcoming smartphones. 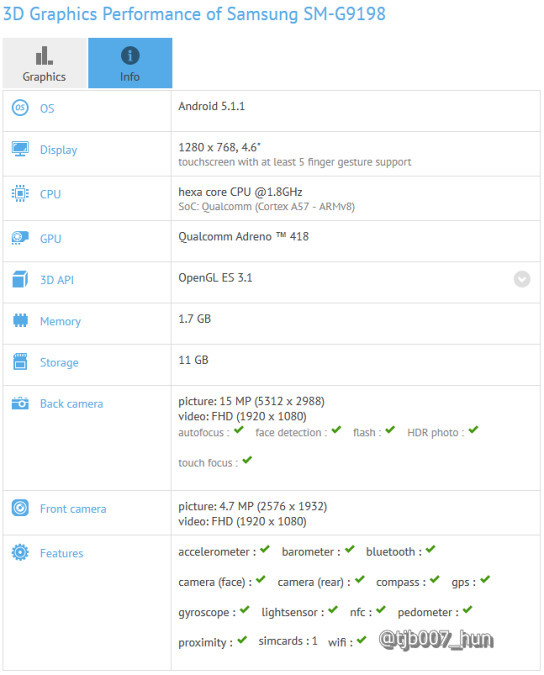 First we saw the Meizu m2 note in there with detailed specs and now we got a brand new compact Samsung droid. The new Samsung Galaxy goes under the SM-G9198 model number and according to the specs in GFX charts it packs a 4.6" HD display (1280 x 768) and runs on the Snapdragon 808 chip. The latter is the powerhouse underneath the newly released LG G4 and comes with a 6-core CPU (2x Cortex-A57 and 4x Cortex-A53), Adreno 418 GPU and 2GB of RAM. The SM-G9198 also features a 16MP 16:9 rear camera with 1080p video recording and a 5MP selfie snapper. The device runs on the latest Android 5.1.1 Lollipop. This is the first time we hear about this new gadget but its display size and top-notch specs suggest this might be the upcoming Samsung Galaxy S6 mini. Just like its bigger sibling, the SM-G9198 packs some premium tech as barometer and motion processor. Whether this turns out the Galaxy S6 mini or not, we are already eager to learn more. Hopefully more details will emerge soon and we'll be keeping you in the loop. Thank you, Anomylus, for the tip! All business man like to 4.6 display phone & 3000 mph battery because this phone can put in packet & long time can talking, use Internet.